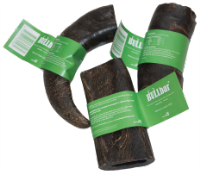 Bullbar Horn Dog Chew is the original, 100% natural buffalo horn dog chew. Dogs who need to lose some weight can also enjoy Bullbars, because they only contain a tiny amount of fat (3%). Naturally, they don’t contain additives or preservatives. They are effectively ‘raw’ and so retain all their goodness and safety. Because it is a natural product and impossible to achieve uniformity in each size category, there are many occasions that Bullbars will appear to look the same size but be priced differently. It is the weight that decides the category, not the length or girth! Product images demonstrate the natural variations in size within each size category. Just like with any chew, buying the right size for your dog is important. The lighter Bullbars will usually be hollow. The heavier ones will normally be solid. 3. Minimum weight 400g (super heavy) - when stocks are available. In the very unlikely event that your dog isn't interested in chewing the Bullbar, try rubbing it with sandpaper or a nail file. Remember, Bullbars are incredibly long-lasting so you may find your dog leaves and goes back to the horn dog chew many times before it’s finished.